The Real Dream Maker promises to make your dreams come true with their revolutionary trading software. Can they be trusted? More important, is The Real Dream Maker a scam? Let’s find out in The Real Dream Maker review. No credit card or personal information required? We’ll see. Like many other binary options scams, The Real Dream Maker follows a predictable template for their homepage, much like Auto Money App by Daniel Rosenberg and Millionaire Blueprint by Walter Green. There isn’t much distractions on the page, only an auto-play video that dominates the screen. The video runs a good 11 minutes long, but there isn’t much useful contents in it except for exaggerated promises and pure hypes. Kevin claimed that he was an unemployed and frustrated man until he used a binary trading software that made him into a millionaire and retired. And now he’s giving away the software for free to help you get rich. Can he be trusted? Not really. Even though the system is advertised as free and no credit card required, you will realize soon that it’s just a lie. You not only have to make a minimum of $300 deposit to get started, you are extremely likely to lose all your deposit in a very short period of time as well. 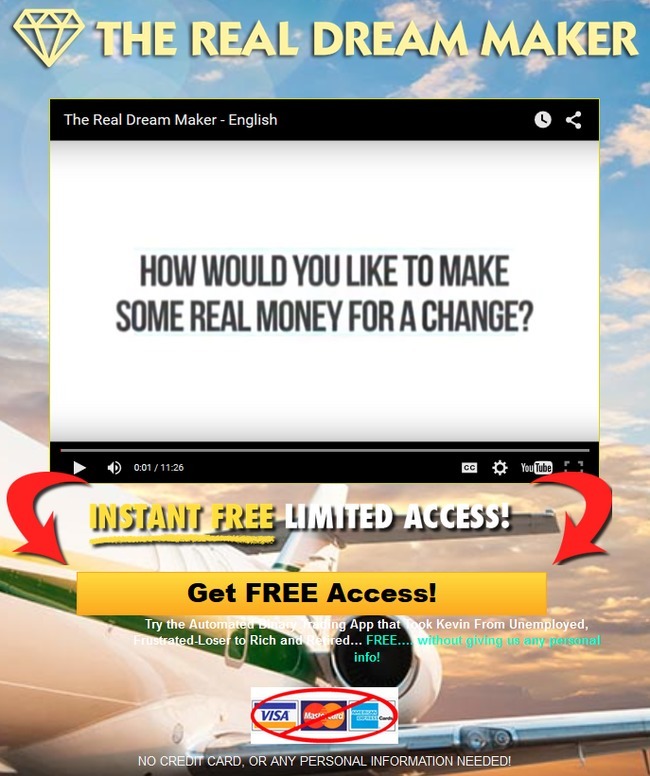 The Real Dream Maker is just a classic binary trading software scam. Before we continue with the review, we will explain briefly how binary trading work so everyone is on the same page. Binary options is basically trading stripped down to its simplest form. Instead of reading financial news and analyzing market movements, with binary options, you only predict if the price of an asset will rise or fall after a short period of time, usually between 30 seconds to minutes. There can only be 2 outcomes – either you are right, or you are wrong (hence the name binary trading). For example, I predict that the price of silver market will drop after 5 minutes time, and I bet $50 on a 5-minute options contract. When the contract expires, if the price is indeed lower, I win and I earn a certain percentage of what I bet, let’s say 60% (which is $30). However, if I’m wrong, I lose the $50 that I bet. To put it simply, trading binary options is not that different from gambling. There’s no good way to predict market movement in such a short period of time. In most cases, you just choose an option based on your gut feelings and luck. Even if you manage a 50% win rate, you’ll still lose money due to the uneven winning vs losing payout. How Does The Real Dream Maker Work? 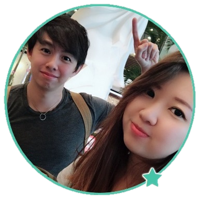 According to Kevin, winning in the binary options market is extremely easy with the help of The Real Dream Maker Software. His software will decide all the trades for you and help you profit. 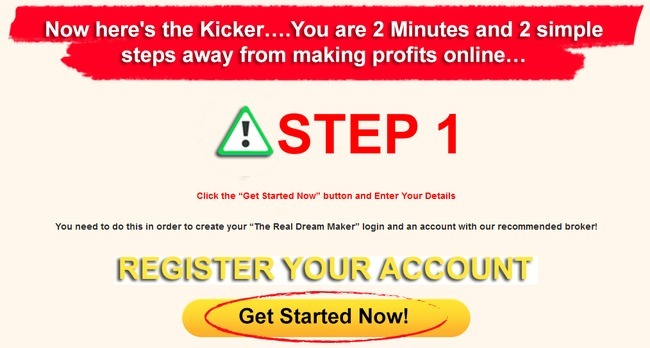 The Real Dream Maker software will run completely on autopilot and make you a millionaire, without you having to make any trading decision at all. Can you believe it? Seems like there will be thousands of millionaires born from this software alone! Instead of turning you into a millionaire, you are actually turning Kevin into a millionaire by handing your hard-earned money to him. Despite promising you no credit card or personal information is required, Kevin is just going to act like that promise was never made when you decide to register for your account. By clicking on “Get Started Now!”, you are taken straight to their affiliate broker’s page, where you need to fill in your personal information and make a deposit before you can start using their software. I was assigned to OptionXL, a broker affiliated with The Real Dream Maker scam. Reviewing OptionXL is beyond the scope of this article, so we will tell you instead how The Real Dream Maker makes money off you. Firstly, if you decide to join The Real Dream Maker and register for a broker account through their sales page, Kevin and the team behind The Real Dream Maker will earn a referral fee as soon as you deposit at least $300. Not only that, The Real Dream Maker will continue to make money off you over the long term. They earn a commission for every trade that you make. Or rather, for every trade their software makes for you. Remember that the app runs completely on autopilot? That’s the scary part. The trading frequency is determined by them, which means they can control how much trading commissions they want to earn from you, as long as you still have money left in the account. And they will profit regardless of whether you win or lose money, ALL AT YOUR EXPENSE. They profit by risking and losing your hard earned money in the binary options market. YES, IT’S A SCAM. As we’ve said in the review earlier, we don’t recommend binary options trading as a way to make money online, at all. It’s not that different from gambling, and using an automated trading software is no different. You are essentially putting your hopes and entire investment in a piece of software that gambles on your behalf. Is My Cash Bot a Scam?